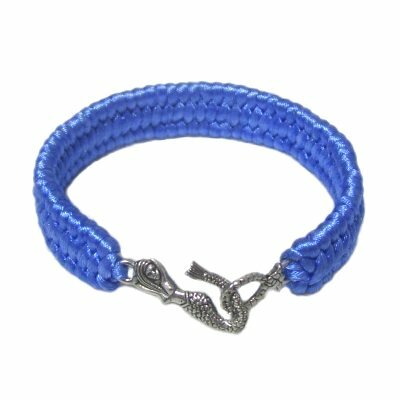 Description: The Weave Bracelet features a crossed weaving technique, which has three segments and resembles a tire tread. It's the same technique used to make the Trilobite Knot. 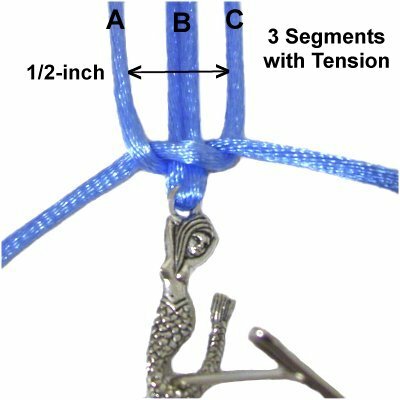 This simple Micro-Macrame design is a perfect way to display a special clasp, like the Mermaid shown in the example. Shipwreck Beads is a great online source for decorative clasps. This Macrame project is easy to make, so is suitable for beginners. Children should be able to make it with help from an adult. 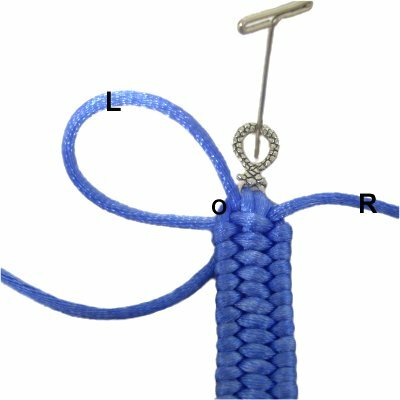 The material used in the example is 2mm Satin cord (rayon). 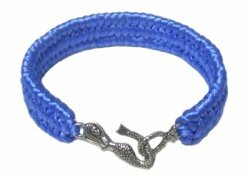 You can use any type of material, including Parachute cord. The width of the bracelet is determined by the thickness of the material. Step 1: Measure your wrist (in inches) to determine the finished size of the Weave Bracelet. This should include the clasp. Multiply the finished size by 16, then divide the result by 36 to get the yards. Cut one cord to that length. Prepare the tips with glue to prevent unraveling. 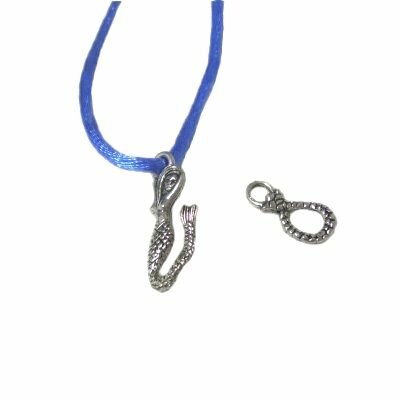 Pass the cord through the opening in the HOOK portion of the clasp. 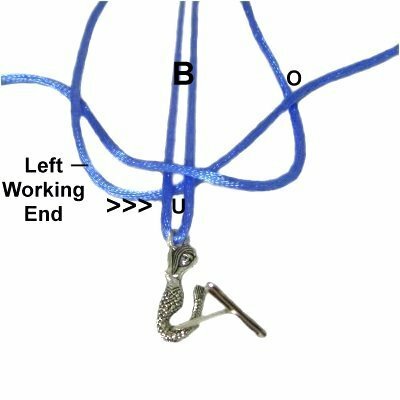 The hook should rest at the center of the cord. Secure the clasp near the front of your board. Step 2: Pass both ends of the cord through the opening in the LOOP for the clasp. Make sure the cord is not twisted or crossed. 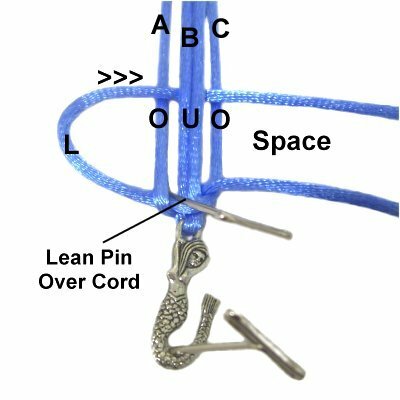 Adjust the placement of the loop until the cord and both parts of the clasp measure the finished size you wish to make. Step 2, continued: Secure the loop so the cord has tension in the area between the two parts of the clasp. Mentally label that area segment B. The loose portions of the cord are used to create the weaving. They are referred to as working ends in the following instructions. Step 3: Bring the working ends forward, so they are near the hook portion of the clasp. Curve the right working end over segment B, heading left. Pass it under the left working end. Step 4: Move the left working end to the right, passing under segment B, and over the right working end. Step 5: Pull both ends horizontally to tighten. The width of the 3 segments will be close to 1/2-inch if you are using 2mm cord material. 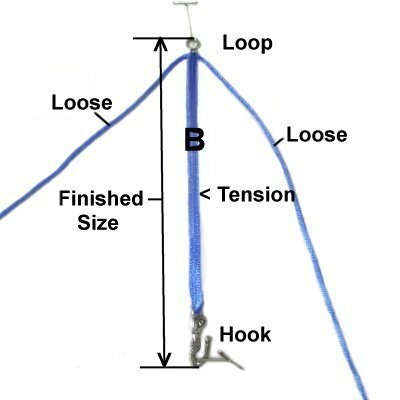 Push the knot close to the hook, making sure all three segments have lots of tension. Step 5, continued: Mentally label the vertical portions A - C as shown in the image above. The working ends switch places every row, so mentally label them where they are currently resting (right or left). 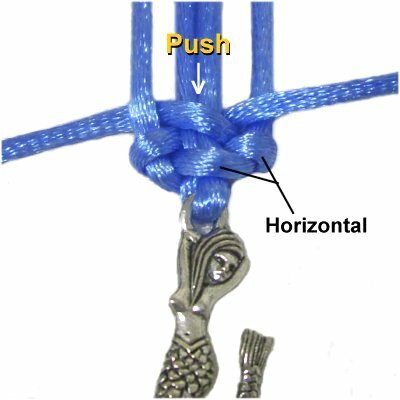 Place a pin next to the knot you just tightened, and lean it backward to hold the cord in that area (see image below). Step 6: Curve the left working end to the right, passing over segment A, under segment B, over segment C.
On the right, leave a space below the working end. Step 7: Weave the right working end to the left, passing under segment C in the space below the left working end. Move it diagonally over segment B, where the two ends will cross. Pass it under segment A, above the curved area of the left working end. 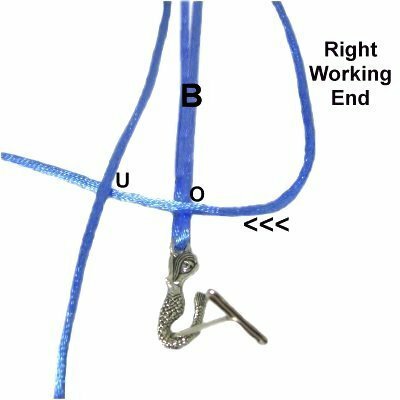 Step 8: The best way to tighten each row of the Weave Bracelet is to pull the working ends firmly, so the loops are horizontal. Then remove the pin. 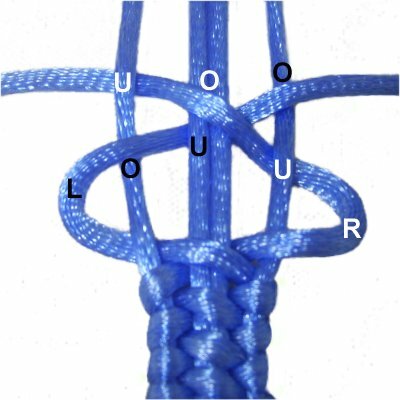 Push the woven area closer to the previous knot, to eliminate the gaps between rows of weaving. You can now lean a pin over the new row (optional). Step 9: Repeat steps 6 - 8 over and over, until you reach the loop for the clasp. Tie as many rows as possible, but stop before the last row (see step 10). 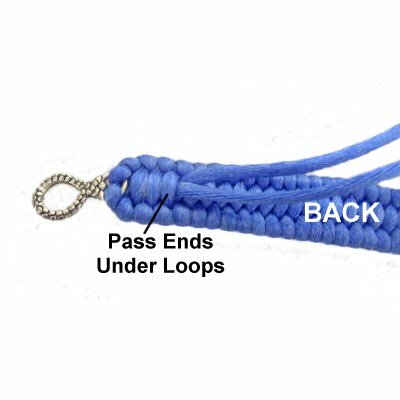 Important: To make sure the Weave Bracelet is neat along the edges, tighten each row of weaving the same amount. Measure the width as you progress, so it remains the same. The loops on segments A and C should be the same size. 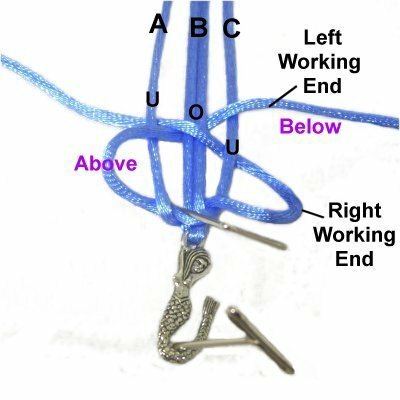 Make sure the loops sure are not twisted, and they are all horizontal. Pushing them closer together will help straighten the entire bracelet. Step 10: The last row for the Weave Bracelet is a little different from the others. Move the left working end over segment A, and stop there, so it rests in the back. Pass the right working end under - over - under segments C - A (same as in previous rows). Step 11: Use fine tip pliers or tweezers to slide the ends under two or more loops in the BACK of the Weave Bracelet. Apply glue (optional), and cut off the excess material. Have any comments about the Weave Bracelet? Contact Me.